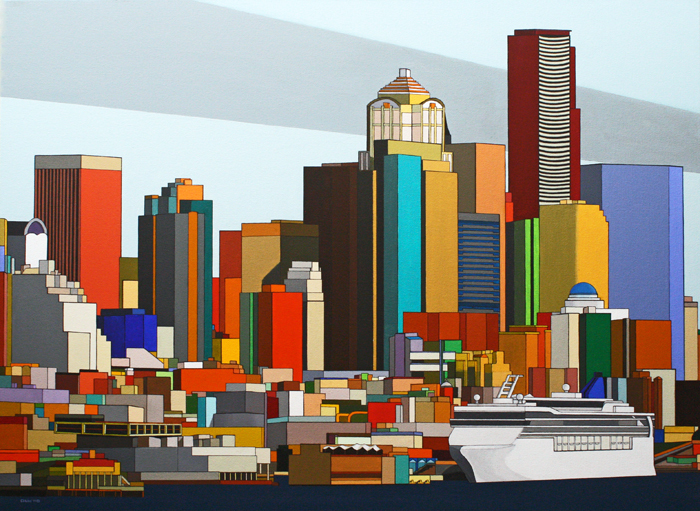 Urban Alternatives: Debra Jan Bibel - Panorama Framing, Inc.
Urban Alternatives, is a display of bright acrylic paintings by Debra Jan Bibel. She describes her own work as an “exploration of geometric morphological forms” as it relates to architecture and city structure. Her work consistently incorporates flat bold colors, precise lines and solid geometric shapes. Bibel strives to create an alternative view of a familiar scape through intense and contrasting colors. Debra Jan Bibel creates her works at Studio Lone Mountain in Oakland, California. She is multi-disciplinary artist, philosopher, Zen Buddhist and scientist. She attended UC Berkeley where she received her PhD. Bibel was raised in a family with a multi-generational heritage in the arts, and has been painting for over 40 years.